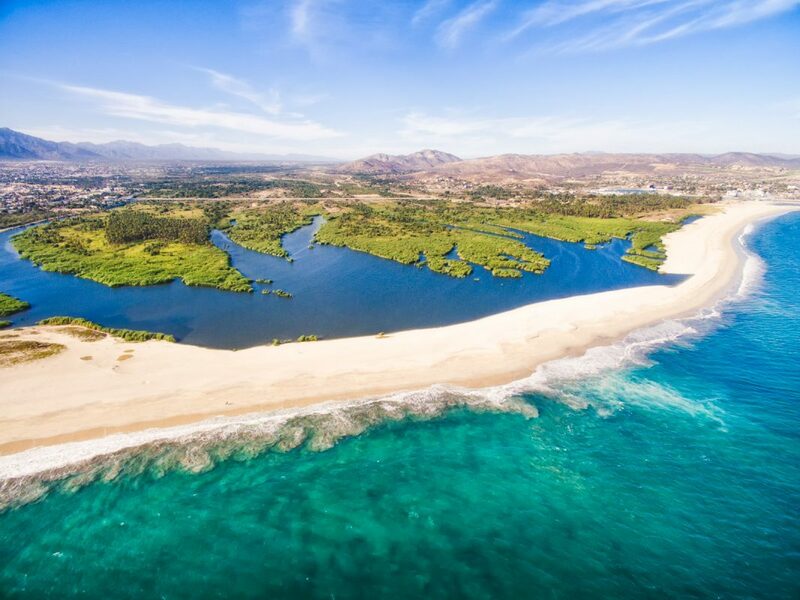 A popular question we often hear is “Where is it safe to swim in Cabo?” Below is a complete list of all the beaches and recommended activities and safety precautions for each beach. 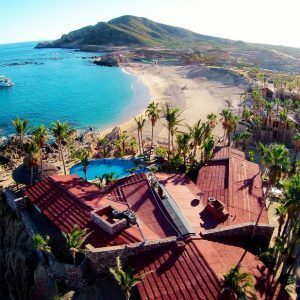 When you book your private villa with Baja Sur Vacation Rentals, the list below and the detailed map of beach locations, will serve you well in your vacation planning. Beach Resorts use a flag system to indicate water safety. Depending on the weather, flag colors may change, so be sure to always check on current beach conditions. Even on swimmable beaches, exercise caution due to these seasonal changes. Blue Flag Beaches – World-renowned eco-certification awards for being clean and accessible, great water quality; meets high safety standards; and works hard to protect local shorelines and ecosystems. A beautiful and pristine beach, but there is no swimming allowed on any beaches located on the Pacific Ocean side because of strong and dangerous currents, harsh waves, and under toes. Located on the Pacific side of Land’s End, Playa Solmar offers spectacular views and long stretches of white pristine sand. Beach vendors are not allowed access. Absolutely no swimming is allowed because the strong currents and powerful shore break is very dangerous. Lover’s Beach (Playa de Amor) is located on the Sea of Cortez side near the famous stone arch (El Arco). The only access to this beach is by water taxi from the marina or Medano Beach. Make sure to arrange for your return trip. Swimming and snorkeling is good on the Sea of Cortez side depending upon the water conditions. Warning! While at Lover’s Beach do not attempt to wade or swim on the neighboring Pacific Ocean side, called Divorce beach, as strong and dangerous under toes are prevalent and very dangerous. 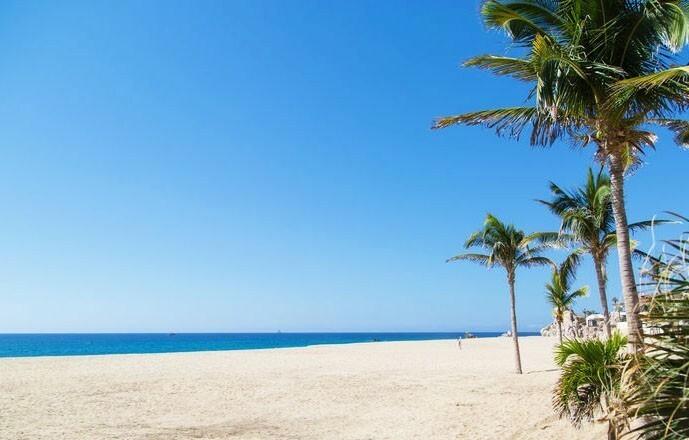 Medano Beach is the safest swimming beach in Cabo San Lucas in the middle of downtown and all the major happenings. The water is calm so is great for swimming. Here you will find all the water activity rentals. Since this beach is the most popular, it tends to be very crowded. For a more peaceful experience, this small beach (located at the end of Marina Blvd. past the Navy base) is popular with locals. This hidden gem is a private, but public beach, with no vendors and is great for swimming, snorkeling, and kayaking. This small beach is good for expert surfing only. 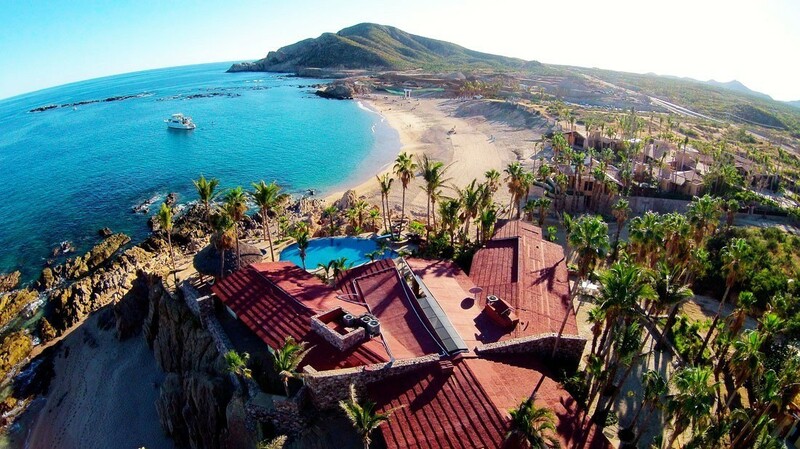 It is the closest surfing area to Cabo San Lucas. Great to explore the rocky terrain. It is below Sunset Da Mona Lisa Restaurant with incredible sunset views. Great beach for snorkeling and swimming. It’s also a nice sandy beach for sunbathing and relaxing. Great for swimming, snorkeling, diving, and tide pools. Although swimming is generally safe, proceed with caution during times when the sea is rough. This is a common diving location for tours. It is located by the Sheraton Grand and the Hacienda Resort. This beach should be top on your list as it has many private coves and scenic rock formations. Great for swimming, snorkeling, and has excellent tide pools. Another beach that should be top on your list is Santa Maria Beach. This beach boast calm, clear waters which is perfect for diving, snorkeling, and swimming. It is claimed as a marine sanctuary with an abundance of tropical fish. This beach is great for families. Great for families, snorkeling and diving. Several reefs are situated in these calm, clear waters with an abundance of marine life consisting of over 80 species. This is a common area for snorkeling and diving tours. Public restrooms and showers are available as well as sandy beach areas and shady places to rest and relax. Very safe for swimming and water sports as it has a man-made break water. Beautiful and private cove with a large bay perfect for swimming, snorkeling and water sports. Great for families. Near the luxurious One & Only Pamilla Resort. Good for the expert surfing only as it has a very strong break with fast swells coming in both directions. Driftwood and boulders on the beach. South of the Arroyo is The Rock and Old Man’s surf breaks. The Rock is best for intermediate surfers and Acapulquito Beach is good for beginners or long boarders. Good swimming during calm seas. Home to the world-famous Zippers surf break situated North of the Arroyo and is for advanced Surfers. Swimming is risky and only recommended for surfers. Many surfing competitions take place here every year. 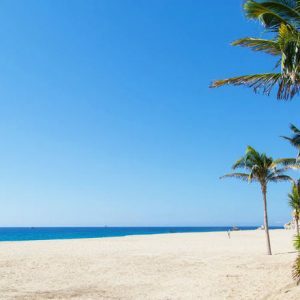 A long, open sandy beach with great scenery and good for surf fishing, beach walks (especially at night), horseback riding, and beach volleyball. No swimming allowed as there is a strong undertow. Located at the north end of Hotel Row. No Swimming as the waves and undertow are strong and dangerous. Also, a freshwater lagoon that has over 350 species of wildlife and beautiful vegetation. Great for bird watching and hiking around the area. 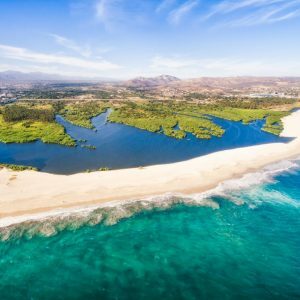 At the marina in San Jose del Cabo are two small swimmable beaches. El Ganzo is a beach club with is open to public for small fee. Playita Beach has a roped-off swimming area and regular beach for swimming, skim-boarding, surfing, and other water sports.